This course has been designed primarily for programmers new to the .Net development platform. Delegates experience solely in Windows application development or earlier versions of ASP.Net will also find the content beneficial. In this lab you will create a WCF temperature converter service. You will host the service in WAS and then IIS, and write a simple console application to consume it. A WCF Service contains the relevant application logic in its methods. It can be hosted at a remote location, and then called by a client using a choice of communication protocols. 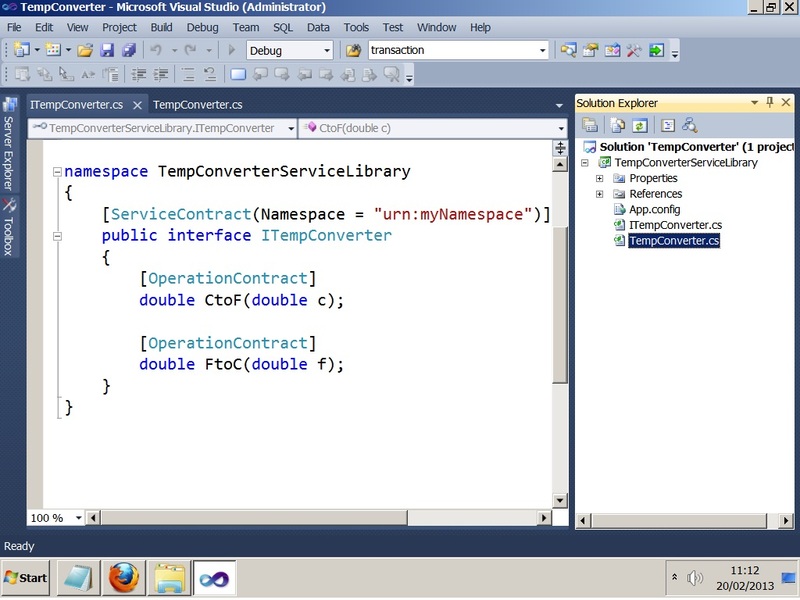 Create a new WCF Service Library project in your solution. 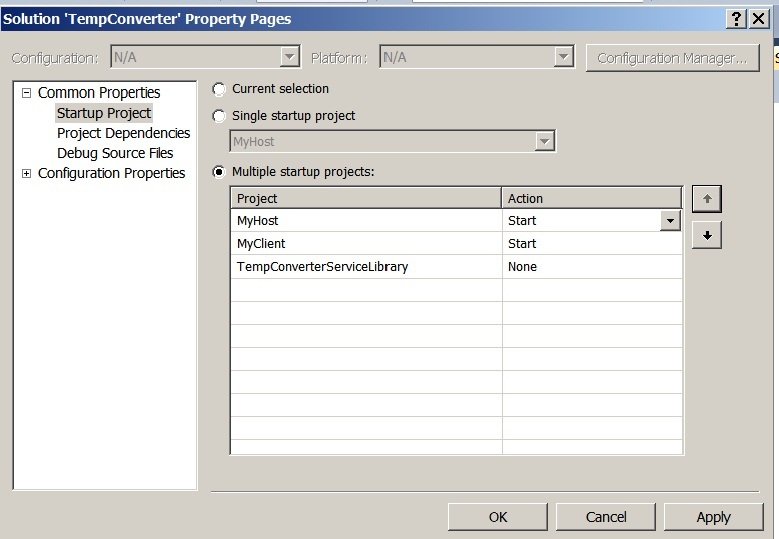 Choose a meaningful name for the project, such as TempConverterServiceLibrary. Rename IService.cs (plus the interface inside it) to something more meaningful, such as ITempConverter. CtoF(), Converts a temperature in Centigrade to a temperature in Fahrenheit. FtoC(), Converts a temperature in Fahrenheit to a temperature in Centigrade. Rename Service1.cs (plus the class inside it) to something more meaningful, such as TempConverter.cs. Then modify the source code so that it implements your service contract. The service can be tested independently, that is, without creating a client to consume the service. The WCF Test Client is used to invoke the service methods. Build your solution to verify that it’s OK, and to generate the .DLL assembly file. In the right-hand side of the window, click Invoke to invoke this operation. This will cause the service to convert the temperature. In the left-hand-side of the window, double-click FtoC() to display the test UI for this method. That completes your exhaustive testing of the service, so close the WCF Test Client window. It’s now time to host the service in a real .NET application. A host listens for calls to the service from client. It then creates instances of the service class as to respond to those calls. In your solution, add a new WCF Service Application project named MyHost. Open the Properties window for your new project. In the Properties window, on the Web tab, locate the Servers section. Click Specific port, and in the corresponding box, type 800 Save your changes. Add a reference to your WCF service assembly. Rename Service.svc to something more meaningful e.g.TempConverterService.svc. Change the Service attribute to your service implementation class. Remove the CodeBehind attribute and value. Open Web.config and notice there’s no reference to your service. This illustrates that your application is making use of default WCF configuration instead. Build your host project and run it. View the WSDL for the service. A client application can call the methods of a WCF service. It does this by creating a local proxy class that represents the remote service class. In your solution, add a new Console project. Choose a suitable name (e.g. MyClient). Add a Service Reference to your project, to reference the WCF service you created earlier (in the Add Service Reference dialog box, you’ll have to enter an address such as http://localhost:8001/YourServiceName.svc?wsdl). View the generated code for the proxy class, if you’re curious. Close the proxy object when you’re finished. Run the client application. Verify that it can access the WCF service successfully. The service will be deployed to the IIS web server. This is a common and straightforward way of publishing services. In Windows Explorer, create a new folder named C:\MyWebFolder. Open the IIS Manager window, by running inetmgr from the Windows Start menu. In IIS Manager, locate the Default Web Site. 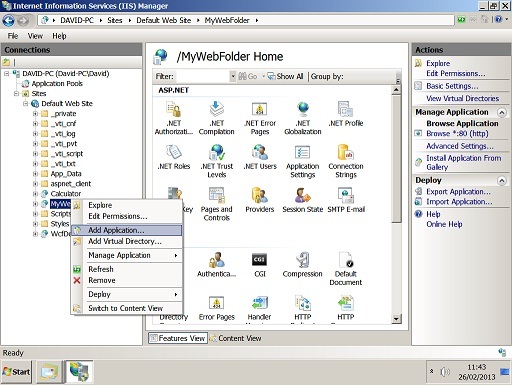 Alias: Specify a name such as MyWebFolder. Physical Path: Specify the folder you created in Step 1, C:\MyWebFolder. Copy your host project .svc file and Web.config files to C:\MyWebFolder. Copy your host project .dll file to C:\MyWebFolder\bin. Copy your Web service .dll file to C:\MyWebFolder\bin. Note: If you get a “403” error in the browser window, it might be because IIS hasn’t been configured to recognize the .svc file extension. Open a Visual Studio 2010 Command Prompt window. Change directory to C:\Windows\Microsoft.NET\Framework\v0.xxxxx (specify the correct number rather than xxxxx). 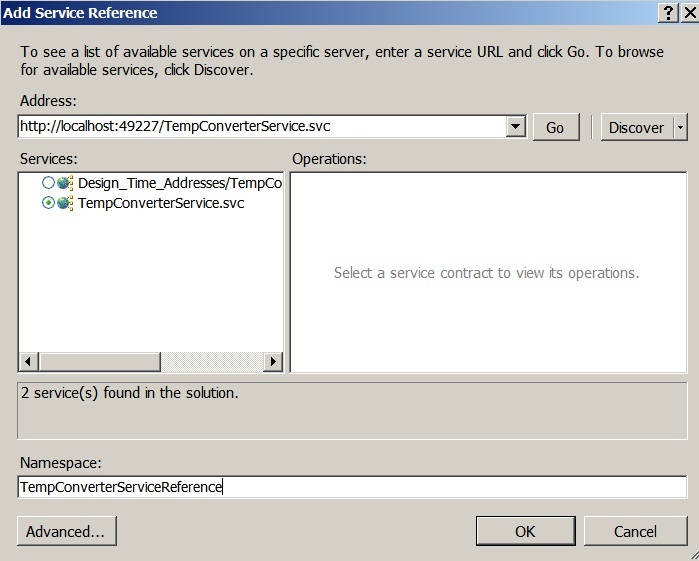 In Visual Studio, in your client project, add a Service Reference to the IIS-hosted WCF service. 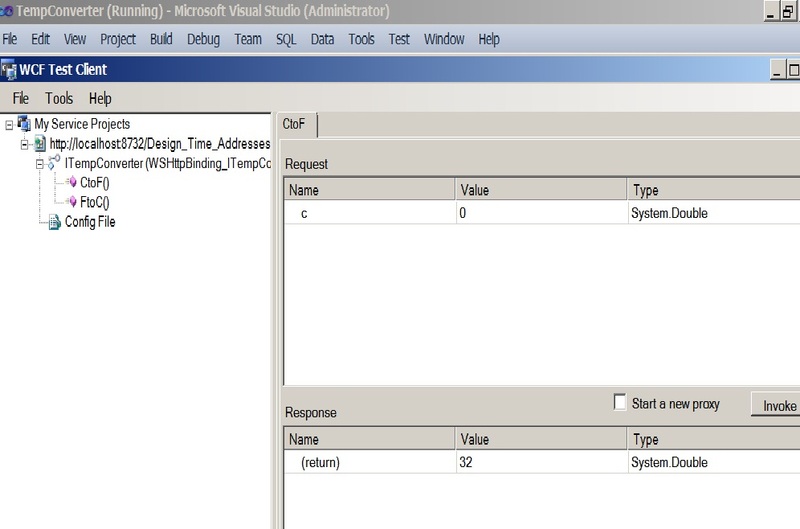 Write code in the client program to invoke methods on the IIS-hosted WCF service.